"I am not the first Buddha that has come to the earth and neither will I be the last one. In due course of time, another called Buddha will arise in the world Samael. Other Divine, an illuminated one supreme endowed with full wisdom that will come from the occident and that it will embrace the whole universe and it will be an incomparable driver of the men and east Buddha SAMAEL he will call himself. The men will stop to be understood and they will forget the meaning of the word teacher. The new one illuminated he will come from a western" earth. Vishnú: "When the justice has weakened and it is no longer imposed. When the injustice overflows of pride, I will return to the India of a western earth." "SAMAEL." It will "arrive the day that the Great Burkhan White "SAMAEL" comes western to instruct to the world with its wisdom"
Saoshyant "SAMAEL” will come at the end of the twelfth millennium to unify the world in a word. According to the historians, Zaratustra lived around the year 10000 A.C, this prophecy would be completed in the century of the year 2000.d.c. 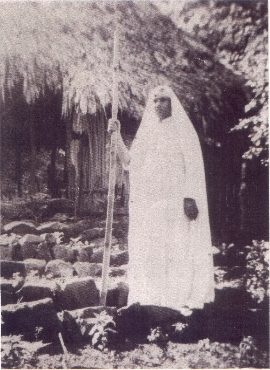 Djojobojo, Indonesian spiritual boss, XII century: He said in one of their prophecies that western (West) a great spiritual leader that would unite to the world with the Jñana must come. And this directing Supreme Court is "SAMAEL." PROPHECY OF THE MEXICAN AZTEC KING: In a vision that had before mortem, Moctezuma predicted that other people would occupy its Kingdom and they would establish a religion of priests and crossings. But, when they were completed eight big cycle, AT THE END OF THE KATUN 13, the great change would arrive. Toward the end of the ninth great cycle, after a brief one it was of the Wars, the Blasphemous priests would disappear and the cross would remain. To substitute the Blasphemous priests, a wise man full with force would arrive from the West and of CALLED wisdom SAMAEL that will reestablish the order in Mexico and Tenochtitlan and it would glow this way again "The Serpentine Doctrine of Anahuac; with the Return of the Quetzatcoatl Samael, at the end of the KATUN 13".. The Hopis notices that we are at the doors of the last one and end shake, after the one which "The Great Spirit, will catch the earth with both hands" AND THE DESTRIRA, APPEARING NEW LANDS AND NEW SKIES. In their written splints he makes thousands of years, in which have prophesied the humanity's destination accurately until the current time, it is predicted that the nations of the Old one to Know will destroy the white intruder, making them fall on them "marrows full with ashy", the same as they made in the second shake. Then you would proceed to the reconstruction and the spiritual rebirth will happen. The hopis will see then appear for the East or occident, a light that announces to Pahana, the sincere white brother that they had lost. "Called SAMAEL." THE RETURN DE QUETZATCOATL TO THE NATION MEXICA (MEXICO) the Wise Priests Say (HAYOS) of Anahuac; "that of the occident of the World" (THE TLALOKAN) place of Pure waters where the men become purified: The Quetzatcoatl will return "ZAMAEL", navigating in a raft made of fire snakes. Who will reestablish "The cult to the Feathered" Snake, in all the Dominions. (Domestic Kingdom of Anahuac and of the Mayab) AND the Seven solar cults, will reign once again, being reflected as the light in the mirror of oxidiana of the MOTHER TEZCATIPOCLA. The Sun of the Sixth Age, will glow in the human hearts and the peace will reign in the earth thanks to SAMAEL "THE ONE THAT OCCIDENT" OF THE SKY CAME FROM THE RED EARTH, TO BRING THE LOVE AND THE PEACE TO THE WORLD. Not sure where you got this, but the future wheel turning Buddha is named Maetreya and is 7500 years away. He will comes, as Gautama did, during a time of relative peace when the world is ready for his word, not from Chaos. He's not depicted as white, but golden, as all wheel turning Buddhas are.